This sleep test and review was done by my sister, Kayla, who recently had her first child, Graham. During a pregnancy, there are a number of pains and ailments that pop up- many of which we can’t control, but restless nights shouldn’t be one of them. Having the proper pillow support during the night helps you wake up feeling refreshed and pain free during pregnancy. This guide is going to review the 6-month performance of the Leachco Snoogle Original body pillow, starting at week 16 through delivery and postpartum recovery. The Snoogle pillow is unique in the fact that it performs as a neck, back, hip, and tummy support pillow all in one. Its unusual horseshoe shape allows complete flexibility and provides support wherever you need it most. The Leachco Snoogle pillow is constructed of a 65/35% polyester/cotton blend with a cotton pillow lining. There are 5 different types of Snoogles- the Original, the Basic, the Chic, the Chic Jersey, and the Chic Organic. While the shapes of each of these pillows are the same, the difference is in the content of the fill varying from 100% cotton, to blends, to 100% organic. For this sleep test I used the Original Snoogle pillow. There are also a variety of removable Snoogle covers. These can be 100% cotton as well, jersey knit, or even velvet. Depending on the price-point, these covers are either a zip closure or a simple sham-style overlay. It comes as no surprise that the unique part of this pillow is its shape. 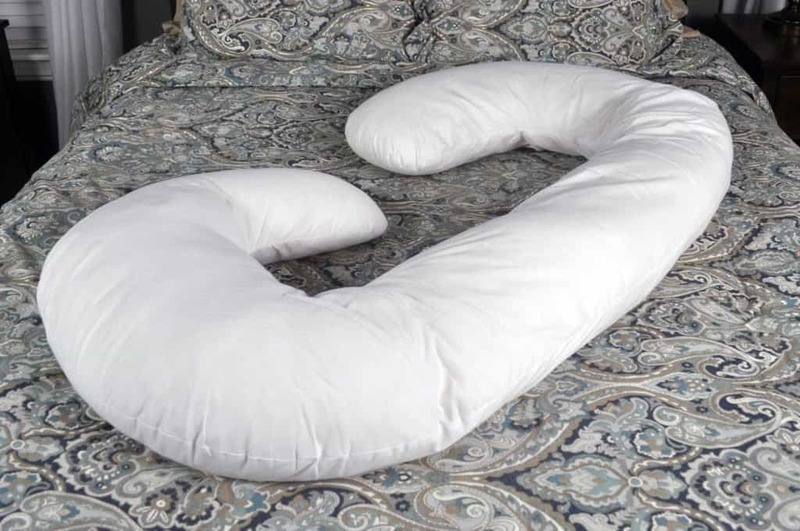 This pillow is curved at the top and the bottom, which allows it to be used in a variety of ways- providing varied support throughout the changing stages of a pregnancy. Right out of the packaging, this pillow is soft yet extremely supportive. During early pregnancy, I alternated using the Snoogle from back to front, depending on the position of the baby each night. The top curve was used as a neck support pillow and the bottom curve was pulled between my thighs to encourage proper hip alignment. Additionally, there was no noticeable off-gassing to note. In mid through late pregnancy, I mostly used this pillow on the front to support the belly, which at this point was becoming quite large. When you’re pregnant, staying cool at night may seem impossible, but the content of the cotton/polyester blended fill allows air to flow through the pillow keeping you supported and comfortable all through the night. One disadvantage is the design of the sham-style cover. The overlay flap is located at one of the curved ends, which makes it extremely difficult to take on or off. The uniquely long shape of this pillow is great for total body support, but it can create a nightmare when you’re trying to adjust the cover. If you can, I would advise to spend the extra cash up front for a zippered Snoogle cover and save yourself a lot of time and frustration throughout your pregnancy. After the baby is born, this pillow continues to be supportive and comfortable. During the first two weeks of recovery, this pillow helps any wraps/gauze stay in place as well as protecting sensitive areas or stitches. I also found this pillow to be useful for nighttime nursing or to prop the baby up for bottle feeds. After over 6 months of continual use, there was a little bit of flattening of the curved ends as well as the mid-section making the whole pillow a bit more ‘floppy’ than when it was brand new. While the pillow itself is not machine washable, the manufacturer recommends spot cleaning with warm soapy water and fluffing the flat parts as necessary. Depending on how hard of a sleeper you are, the Leachco Snoogle Original pillow may last through multiple pregnancies with proper care. The Leachco Snoogle Original pillow is a versatile tool to have during a pregnancy. As your body grows and changes, so too does the Snoogle, which makes it a little easier to get some sleep and still wake up refreshed and well rested. 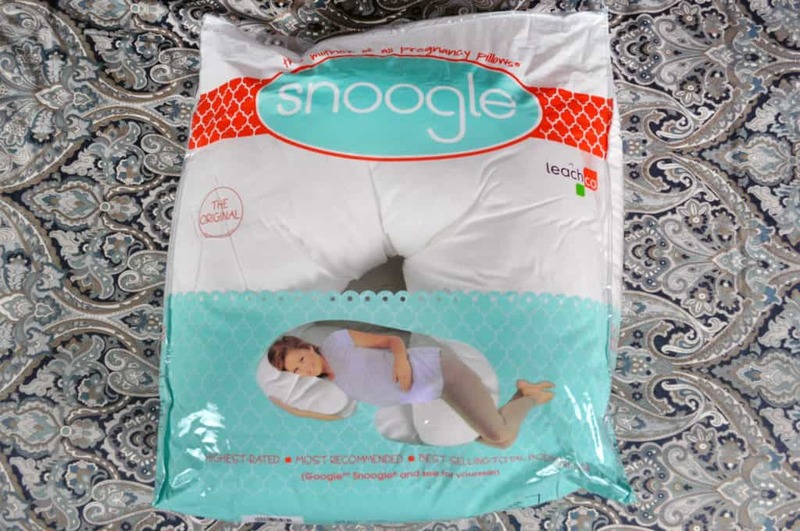 While it may be a little difficult to clean, the uniquely long shape of the Snoogle serves as an all-in-one pregnancy pillow. The pros outweigh the cons on this one making the Snoogle one of the best purchases made during my pregnancy. For more information on the Leachco Snoogle Original body pillow, check out their product listing on Amazon.com. Leachco’s Snoogle body pillow is a great one-stop-shop kind of pillow during pregnancy. Neck pain, back pain, hip pain? The Snoogle boasts in its ability to relieve them all and for only $50, it does a pretty good job. After over six months of continual use, its ability to contour and change throughout the pregnancy, continued to impress. I only wish the materials were a bit higher quality so that it could withstand use through multiple pregnancies.